The maxim “know thyself” was well known among the ancient Greeks and to this day people still recite those wise words – especially when searching online for “how-to-genealogy.” Casually known as one’s family history or tree, genealogy is the study of family lineages and defined by the Society of Genealogists as the “…establishment of a Pedigree by extracting evidence, from valid sources, of how one generation is connected to the next.” In addition to helping individuals figure out their roots, genealogy can also offer a more-detailed view of their family’s role in the grand scheme of history. While many people are motivated by the possibility of discovering that their relatives may have been wealthy or famous, it can be illuminating to learn about one’s own heritage and rewarding to pass that knowledge down to future generations. Genealogical information can bring families closer together, offer a new perspective, and guide future decisions. Best of all, it allows one to… know thyself. Genealogy offers a wealth of information and sometimes its findings have a significant impact on people’s lives. Throughout history, kinship and descent often demonstrated legitimate claims to power and wealth. Although not many people these days have an official claim to an iron throne, there are still several reasons why outlining a family tree can lead to big life changes. It’s no secret that many health conditions and ailments are hereditary, meaning that they were transmitted at birth from one’s parents. For those who have been or could have been passed down a hereditary medical condition, preventative measures can lead to much-improved health. This is where genealogy can be a literal life saver. Studying family health history can identify the necessary steps to avoid harm. For example, someone with a family history of skin cancer can take preventative measures like staying out of the sun and loading up on the sunblock. Additionally, doctors use family medical history to determine the type and frequency of screening tests, make recommendations for lifestyle changes, assess risk, and identify other related conditions. In order to create and track a family health history, individuals can use My Family Health Portrait, a tool provided by the U.S. Surgeon General. Being able to prove that you’re related to someone can also have significant ramifications in regards to taxation, land ownership, estate administration, and forms of inheritance. Additionally, when conducting family history research, there are many genealogy-related terms that may pop up on legal documents. For example, a “dower” is the share of a husband’s real estate to which the widow is entitled upon his death and a “relict” is the widow of a deceased individual. Navigating the legal landscape can be difficult without the help of a professional, but there are resources out there that can aid the amateur genealogist. One is the FamilySearch Genealogical Dictionary of Legal Terms and another is the paperback book Genealogy and the Law. There are various reasons for why family ties are severed over time, but fortunately, there are numerous resources available to individuals looking to retrace family connections. This may apply to the adopted who are looking to find their birth parents or mothers looking to find their children given up for adoption. Alternately, genealogical resources can be used to determine the biological father of a child. As mentioned earlier, throughout most of history, kinship and descent were often the impetus for maintaining genealogical records. Their primary role was to demonstrate legitimate claims to power and wealth, while heraldry was also used to track the ancestry of royalty through armorial bearings. In the United States, several organizations emerged in the 1800s that began to gather genealogical records, including the New England Historic Genealogical Society and the Genealogical Society of Utah, which later became the Family History Department of the Church of Jesus Christ of Latter-day Saints – and they eventually launched FamilySearch. Today, especially after the spread of the Internet, interest in genealogy has expanded largely due to access to resources, which range from websites to societies. While all this talk of legal terms and genealogical societies may seem intimidating, one of the most efficient ways to research family history is to simply talk to relatives. Don’t be afraid to put pen to paper and start sketching out a family tree, because grandparents can offer a wealth of information. The key is to start at the present and work backwards. Relatives can offer invaluable leads that will fill in the blanks and save time. To keep track of collected material, you can employ a pedigree chart, such as this free one offered by Progeny. Or you can print out a family group sheet. Once you’ve collected all the information available and have your leads, you can begin the hunt for official records. When dealing with decades-old paperwork and online searches, it can be difficult to determine which sources are accurate. Fortunately, there are steps that can be taken to help ensure information is authentic. To start, begin research with your family (as mentioned above). Chances are much higher that your relatives have collected documents, photos, and memorabilia that pertains to your family tree. Next, search for original sources. These are defined as the first recording of a document or event and can include facsimile microforms, photographs, unaltered digital reproductions, and the like. Finally, derivative sources can also offer information but do not include original recordings. Derivative sources can include transcripts and indexes, as well as compiled records like local histories, books, and websites—all of which are compiled by a third party. There are many different sources for obtaining genealogical records and it’s important to cast a wide net in order to get the best results. Here are some ways for you to start your search. Some libraries have entire departments or buildings dedicated to genealogical records. With the aid of a short list of names or a family tree outline, reference cards can get you the leads you need. Reference cards are often organized in a few different ways: by surname, geographical region, historical event, historical society, or local departments like the police or political office. Assuming your last name isn’t one of the most common, searching the surname will hopefully give you a handful of solid clues, possibly directing you to books, newspapers on microfilm, etc. 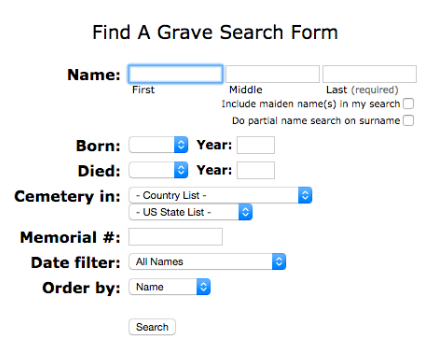 Even a simple obituary can help fill in the blanks by sharing birth date and location, when or where a person moved, who they married, maiden name and marriage date, and the names of children and their locations. Ships’ logs may also be available. Most ships back in the 1600s and 1700s kept ship logs that with information about who was on the ship, where they went, and sometimes even what trade they were in and who they were traveling with. Local census records might help you find potential relatives, but won’t likely offer too much information. Some might provide townships or addresses, while others will simply list first and last names. Additionally, many libraries keep yearbooks tracing back to the 1970s, and some much further back than that. If you have a library with a thorough section, you might even find school records and photos from the 1800s. The Olive Tree has links to many resources, including aforementioned ships’ passenger lists and census records. If you know that a family came over from a specific country, you can find a book of emigrants that lists anyone who left a country and it will often tell you the date and where they went. Some countries also have logs of immigrants that include when they arrived and where they came from. A great resource for U.S. residents is the National Archives and Records Administration, which is a federally-funded collection of public records. It is easy to use, though most searches point you to external links that source from various places on the Internet. 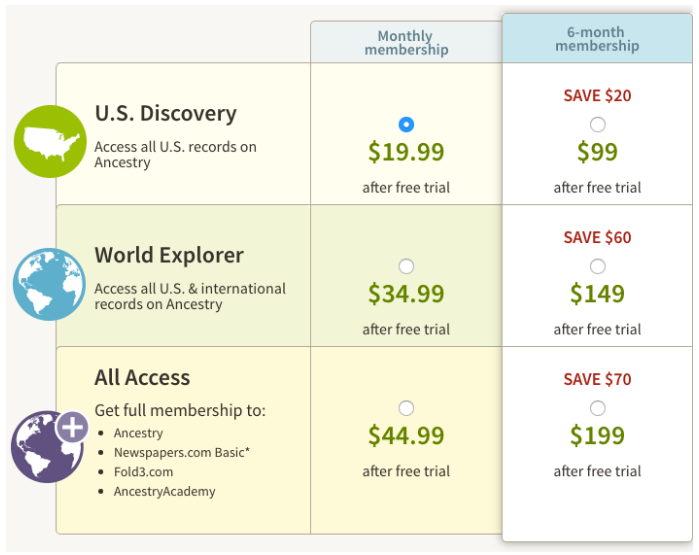 Ancestry.com is one of the most well-known names in genealogy. It is a subscription-based service with a three-tiered quality option. It also offers an additional DNA Analysis service for a charge. Once you’re a member of Ancestry, you can link up with other subscribers in your family and share information with each other. The more you network, the more you can find. MyHeritage.com is very similar to Ancestry.com and it offers an intuitive design that lets you build your family tree while suggesting possible matches along the way. However, it is also a paid service and it does not offer monthly payment plans. All plans are billed annually and a free trial is unavailable, so make sure you’re ready to make the commitment. The site also analyzes the data in your family tree and can show countries of origin on a map with clickable links to profiles. MyHeritage also offers a DNA collection kits and crunches data to show you things like which months were the most popular to be born in your family or the average life expectancy. Genealogy.com maintains a forum for people to connect, as well as searchable read-only versions of old articles. The family-tree maker service seems to have a few bugs but has clickable links to help guide you through connections others have made. Though it is not at its prime, the website does offer a great deal of information. One of the best free resources available is FamilySearch.org, still maintained by the Church of Latter-day Saints. It has a fully functional search that can very quickly pull up census records, ship logs, etc. 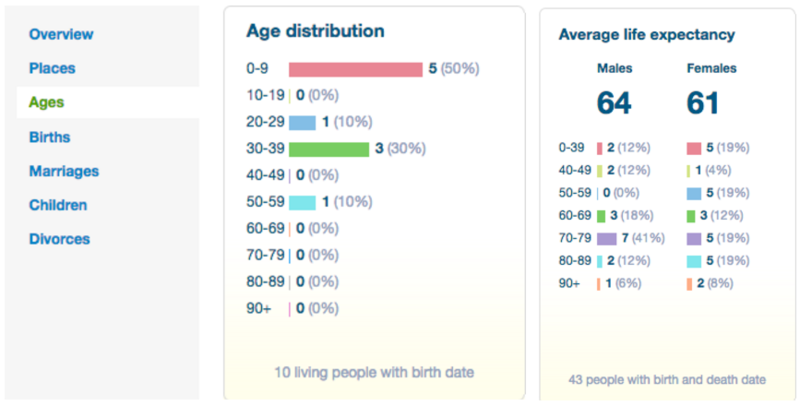 By simply searching for a known relative, one might be able to pull up their family relationships as well as a photo of the census they are listed on. If you’re not finding the records you were hoping for on other sites then you might want to consider World Vital Records. It is a subscription-based aggregation of 4.2 billion names that’s also a sub-company of MyHeritage. Another potential resource is the Surname Index, a resource for anyone who might want to know the history of their surname. It is free and a not-for-profit operation, but it is not the most extensive resource. Because it began with its roots in Ireland, most of the entries stem from Irish surnames. Though it may sound morbid, a graveyard can also be a great resource for information. Generally speaking, families are buried nearby each other, some of whom are even listed on the same headstone. 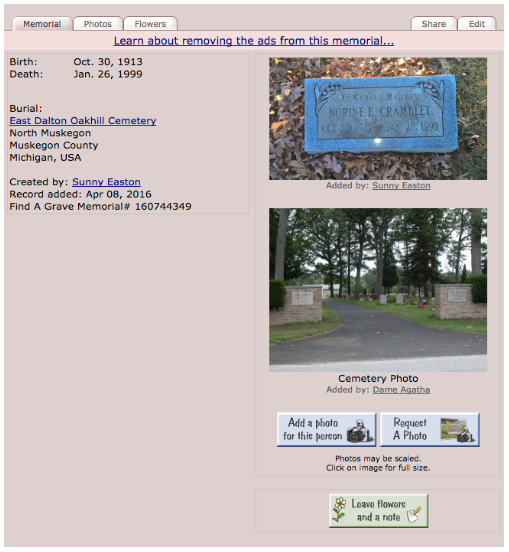 Photos and recorded details of grave sites across the country are compiled in the Find A Grave index. Each entry has a photo of the headstone along with any information on it. Local historical and genealogical societies bring people together to collect and reconstruct their histories. Societies are generally formed out of necessity by a group of people who have a certain trait in common, be that a historical event or country of origin. Sometimes societies require an application and dues to join, other times they are rather informal, but most are not-for-profit or charity-based. A well-known society is Daughters of the American Revolution, which has collected and pieced together an impressive amount of historical information. 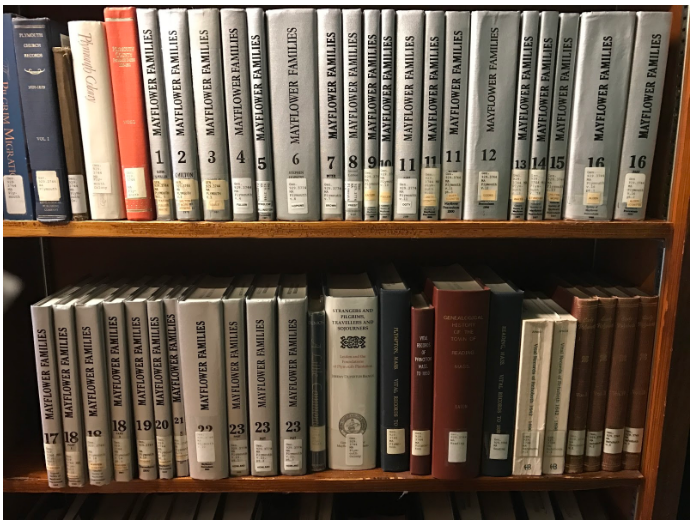 Additionally, the National Genealogical Society, Federation of Genealogical Societies, and American Society of Genealogists are three of the major players and would all be great places to start. The larger and more prominent societies tend to offer things like conferences, educational courses, publications, and even special access to online genealogical databases. When you’ve exhausted your options, or perhaps just your patience, you might consider hiring a professional to help you continue your search. It may sound expensive, but most professional services use individual agreements between the historian and the person hiring them to agree on the terms of their search and the price. If you want to see what you can get for $500, there’s an option for that. Otherwise, sparing no expense to find out about a specific lineage has an option too. Heritage Consulting specializes in genealogy story creation. Instead of hiring a genealogist specifically they work as a team to exact the details of your past and give you a comprehensive report. The price is per hour and the number of hours needed varies wildly between families. American Ancestors began as a project by the New England Historic Genealogical Society. They offer collaborative reports or create lineage mappings. However, at $105 per hour, services aren’t cheap. The Association of Professional Genealogists is probably the best place to look for a genealogist. It is, essentially, a comprehensive list of genealogists with a biography on each, including the work they’ve done, professional certifications, and even testimonials from clients. National Archives: Calendar of Events – Free; Local to Washington D.C.
World Vital Records – Paid Subscription; Census, birth, death, marriage, etc.